This is the fourth collection that we have stocked, and Follie features fuchsia stripes, oversized checks and taupe woodcut nature prints, all designed in her scaled back and considered aesthetic. In case you aren’t familiar with Lotta’s work, she’s a Scandinavian born textile designer, who works from her studio in Brooklyn, NYC. The studio is open on specific days throughout the year, advertised on the website (in case you are lucky enough to find yourself in the neighbourhood!). She also runs print workshops, in the USA and Sweden. “Lotta Jansdotter’s designs are like little plants working their way through cracks in the sidewalk. Things of simple beauty that bring relief to the urban landscape. Lotta’s work is about her life, and life is her inspiration. Her genius lies in exploring the beauty of everyday things. To find out more about Lotta Jansdotter’s work visit her website. To listen to an interview where she talks about Follie, go to the Modern Sewciety here. Apartment Therapy interviewed her last year. The video is on their website here. 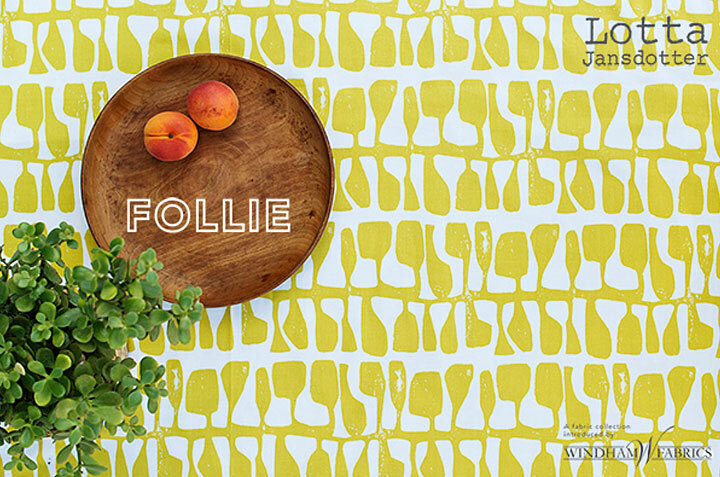 You can find fabric from Follie, as well as previous ranges, on our website here.